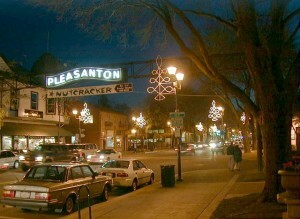 With a town motto of “The City of Planned Progress,” charming Pleasanton maintains its small town appeal despite having grown rapidly in recent years, with traditional shops, the Pleasanton arch, and historic Pleasanton Hotel blending gracefully with modern developments and thriving industrial parks. Pleasanton is home to many local landmarks such as Hearst Ranch and the Pleasanton Race Track, and also hosts the annual Alameda County Fair. The town exudes a welcoming spirit, offering many community events year-round including parades, Saturday morning farmers’ markets, Friday Concerts in the Park series, and the popular First Wednesday celebrations, when Main Street is blocked to traffic and adopts a street fair atmosphere. Pleasanton Race Track – This racetrack features horse races year round but is also the home of the Alameda County fair which has been hosted there in Pleasanton since 1912. There is also a 9 hole golf course located on the infield of the track. Alameda County Fair – Hosted in Pleasanton each year this fair features food, rides, and much more!